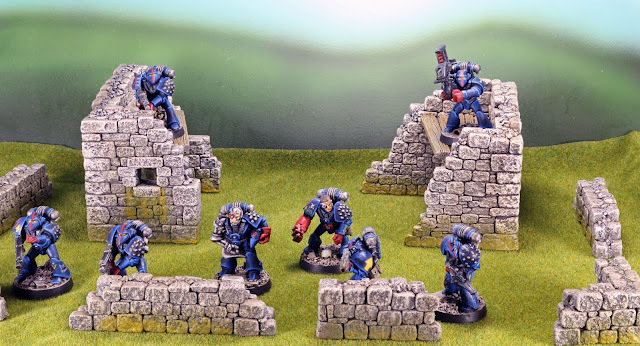 If you can't tell from my blog, I am a sucker for terrain. It's just great. But, like miniatures, I buy a lot of it, stick it into a box, and never touch it. 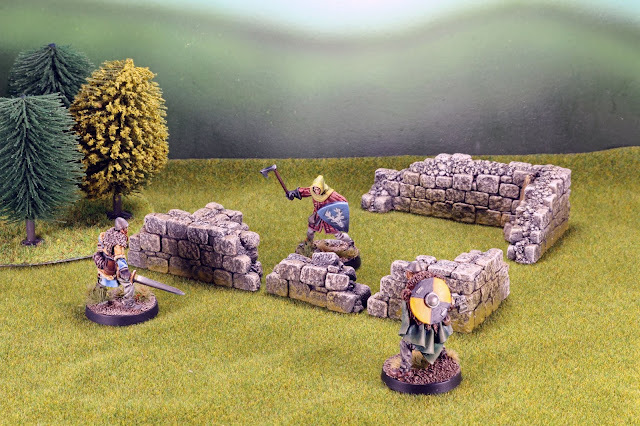 So when the Battle at the Farm Kickstarter arrived from Fogou Models, I was determined to not let that happen. When I first saw the pre-release announcement and all the other blog posts about the sets, I knew I was going to buy it. I've been eyeing Fogou's stuff for a little while but I've been too lazy and cheap to order any (shipping to the USA can get expensive!). And I have to say that this was one of the fastest filled Kickstarters I've ever backed, so kudos to Fogou for that! The set comes with two ruined buildings and a bunch of walls and rubble sets. I've shown them above with some Rogue Trader models, but part of why I wanted these is their versatility. They'll work equally well in fantasy and historical games as it does sci-fi. I painted the ruins pretty quickly. I airbrushed several layers at progressively higher angles using Tamiya paints thinned with lacquer thinner. Tamiya markets these as acrylics, but they really aren't. But the big problem with using them in an airbrush is that they are toxic, especially if you use lacquer thinner. I got lucky in that we had a string of low humidity days here in Virginia so I could paint them outside. I started with a mix of black and grey, the went up to grey and then began mixing in an off white color up to the pure off white. Because the paints were applied really thin, I went back and dry-brushed them with Citadel Tyrant's Skull and then hit the edges of the panels with Wrack White. I followed this up with a super high gloss varnish I get from a craft store. These are terrain pieces after all and will be handled roughly. I gave the varnish twenty four hours to dry and then I applied an oil wash made from a mix of payne grey, brown, and black. When that was dry, I was able to clean up any excessive pooling with a little white spirits. But I did re-dry-brush them in certain places to add a little more punch. One of the ideas I wanted to steal from Asslessman was to apply glazes over random stones to give a little bit of variation. But I decided against that as, quite honestly, I was too lazy. 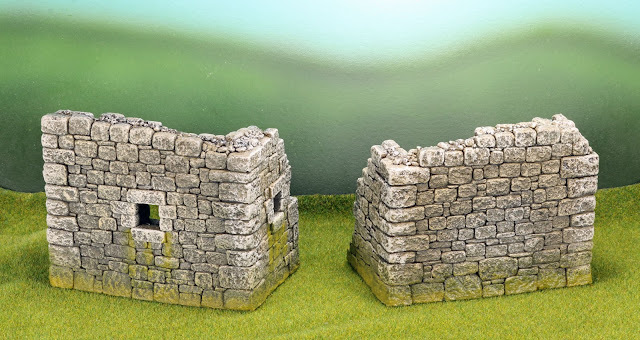 But, instead of applying random tones to the stones, I did add a series of thinned layers of Vallejo Dark and Light Slimy Grime and Moss and Lichen. I applied these heavily thinned over several layers to look like the grime of years building up at their base. Those look the mutt’s nuts! I especially like the moss effect at the bottom. These are especially nice terrain, some of the best I've handled. Yea, I'm going to back over them with my car later tonight. I don't want offend my eyeballs any more with them. Thanks! They are definitely a great set of terrain. Really nice feeling of weight to your paintjobs. And I like the blending on the bottom that make them integrate nicely with your table. 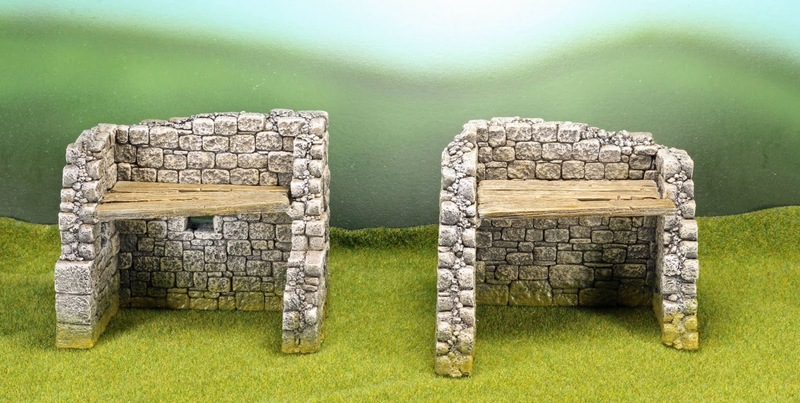 These really are great and versatile terrain pieces. Nice job on them.